NEW MUSIC IS COMING SOOOOO SOON! Avril made a rare public appearance at the 25th annual Race to Erase MS Gala in Los Angeles, April 20. Looking absolutely ravishing (like always), could this be the start of some more public appearances as she finishes up the new album?! Slowly but surely Avril is giving us more information regarding new music. She has finished the last song and is working on mixes.. SURPRISE! NEW AVRIL CHRISTMAS MUSIC! Avril took to Facebook last week to discuss the LymeLight Foundation and The Avril Lavigne Foundation. She even threw in some information about the upcoming AL6 album! DJ's Grey (best known for partnering with Hailee Steinfeld and Zedd in 'Starving') is releasing their latest EP, 'Chameleon' tomorrow, and one of the tracks features Avril! Listen to "Wings Clipped" below and buy the song on iTunes September 29! Today, miss Avril Lavigne turns a cool 33 years young! 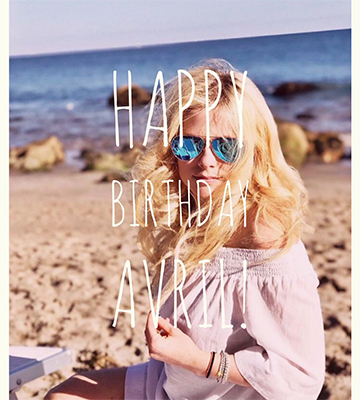 Wish her Happy Birthday on her Twitter or Instagram (@avrillavigne). Every year for Avril's birthday she asks for our help to give back to others in need. This year, she's again raising funds to helping people with Lyme Disease get the care they need. DONATE HERE!. You could get some awesome prizes! ...And again leaving Peppermint Club on August 8.